Last Sunday was our family craft day. Since we hadn’t had one in awhile, we were definitely overdue. 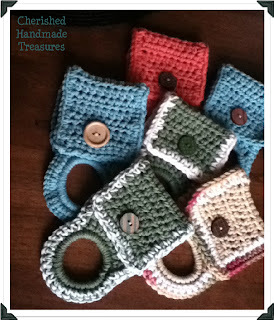 I saw a version of this project while surfing the web last month and thought it would make a good craft day project. There are a few different versions of this dryer vent pumpkin out there, some call for the plastic vent, but for the most part the assembly is the same. After it’s painted, add your own simple touches to make it unique. Cut a 24” length of the metal dryer vent. 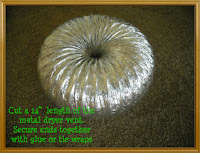 Secure ends together with glue or tie wraps. 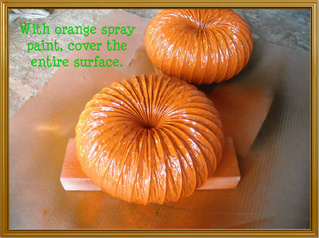 With orange spray paint, cover the entire surface. 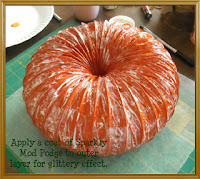 Apply a coat of Sparkly Mod Podge to outer layer for glittery effect. 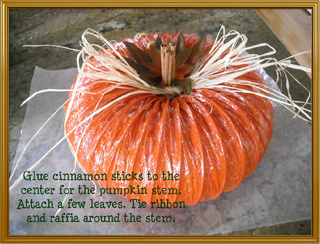 Glue cinnamon sticks to the center as the pumpkin stem. Attach a few leaves. Tie ribbon and raffia around the stem. 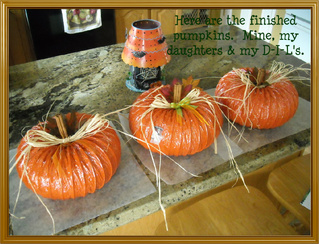 I have a few Halloween projects that I’m either trying to finish up or just get posted, so I hope you’ll check back. 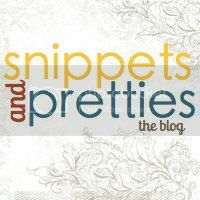 If you like what you see on my blog, please vote for me at Picket Fence Blogs. Just click the button below. Yep, she's a goofball. She passed the camera to Hayleigh, told her to take a picture of her and then put those googly-eyes on her face. im making a quick visit from Alexa hop. That's amazing what you did with dryer vent tubes!! Thanks for the follow. Following back . Thanks for the follow. I'm now following you back.